Today is one of those "dog wash" days, a day to putter around and not do anything too challenging. However, I also want to cross some things off my Project List. 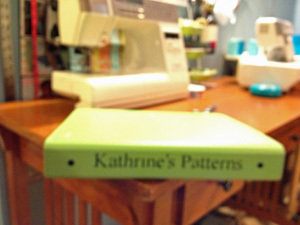 My sister-in-law had given me a folder full knitting and crochet patterns that had belonged to my mother-in-law. She passed a couple of years ago, so I wanted to keep them as a way to honor her. Most of the patterns were photo copies, so I got an empty binder and my page protectors and worked my way through the stack. There were lots of patterns for afghans and ponchos and novelty items, like Christmas decorations. There were some patterns written out on scrap paper—the back of a letter or greeting card—that didn't say what they were for. I even found two patterns for Christmas tree shapes cut out of old paper shopping bags. Kathrine was green! 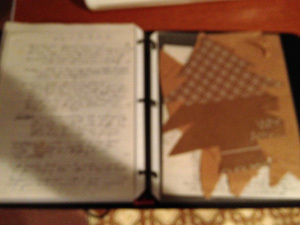 I put all of the page protectors in the binder, with a couple of booklets in the binder pocket. I cut a label from vinyl using my Silhouette. I'm happy to check this off my list and to have honored Kathrine with something pretty. Can this chair have new life? I love the story of this chair. It belonged to my husband's grandfather. When he became unable to live alone, he stayed with his children. The plan was that he would stay with one for a while, then another. But you know what they say: Make plans and God laughs! After staying with my husband's family for a term, he then went to stay with a daughter. The very next day, they brought him back! I can just imagine what my mother-in-law might have been thinking. I know what I would have been thinking! His beloved rocking chair was tied to the vehicle carelessly (Were they in that much of a hurry to ship the poor man out? ), so that it was too close to the exhaust pipe. That's why the upper corner of the back is burned. For sure, I want some of that mark to stay—it's the stories that give value to family heirlooms. 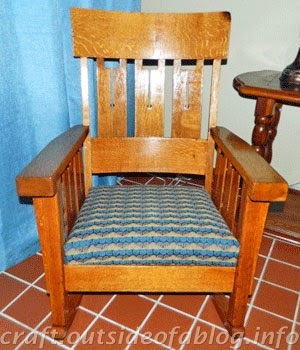 I used Formby's Build-up Remover on the right side of the chair (the right side of the picture above) before I took the picture. You can't really see a strong difference, but it did clean off a lot of gunk. Still, there is dark staining on the chair back. I am so happy with how this chair turned out. 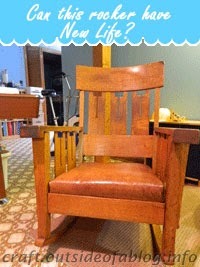 I finished using the build-up remover on the whole chair, having removed the seat cushion. Then I sanded the whole thing. (I know, the build-up remover was pointless.) I finished with a couple of coats of varnish. It's clean and shiny, but still has that burn mark. The seat got new foam padding and was covered with home dec fabric I had picked up at JoAnn's—staple gun upholstery, is there any other kind? I'm happy with the way this turned out: pretty, but not too girly. I wonder if grandpa would like it.